most part to a record-breaking year. Ultimately, 49 wins in 06-07. Devils have always responded to a hands-on demanding coach, and Julien was not that type of coach. 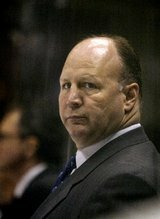 while Julien lead the Boston Bruins to a Stanley Cup. You put the rest of the pieces together.